Precision Energy Meter Kit (WattsOn – Meter Kit) – AYA Instruments, Inc. 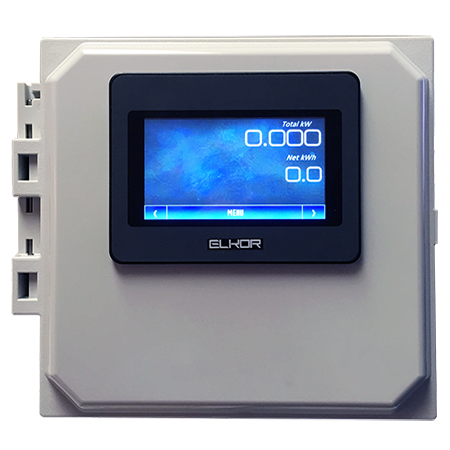 The Elkor Energy Meter Kit includes the WattsOn-Mark II precision energy meter installed in a NEMA panel with a touch screen color graphical display, pre-wired with a power supply. The kit is available with various CT styles and sizes. The kit may be ordered in a small (8”x8”) or medium (8”x10”) enclosure. Both enclosures include a universal (90-264VAC) 24VDC power supply which is used to power the meter and LCD. It may be used to power auxiliary devices inside the panel such as controls or gateways. Optional components such as shorting blocks, fuse blocks, or client supplied accessories may be installed. The LCD touch screen panel features large, easy to read fonts and the ability to configure the display and meter locally. Trending is available over 24h, 1h and 2 minutes. The communication between the display and the meter uses the auxiliary meter port, keeping free the main communications port (optional BACnet or Modbus, serial or Ethernet) for connection to external equipment, RTUs, PLCs or gateways. The display may be customized by either the client, or by Elkor for a variety of features, display functions, logging, trending and visualizations (graphs, gauges).